Kraupie's Real Estate & Auctioneers – Selling Land & Machinery across the Nebraska Panhandle and Beyond!! Take a look! With a little TLC this property would make a great home for a family or an income producing investment! Nice Country Acreage on the road to Lake Minatare! 350 Bales Alfalfa Hay! ONLINE ONLY AUCTION! LATE MODEL EQUIPMENT! Full Line! Including JD 8310R, 8430, 8130, 8210, JS S680 Combine, Cat 924K & 924G Loaders, Full Line of Tillage, Planting, Hay, Harvest, Trucks, Trailers, Livestock Equip & Shop Items. Commercial Pizza Restaurant Equipment including BIG Hobart Mixer!! 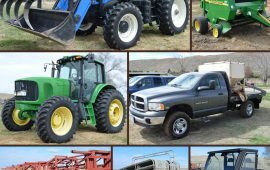 Great line of ranch equipment including New Holland T6050, John Deere 7320, Hydrabed Pickup, Livestock supplies, and more! Great 2 Bedroom, 2 Bath home featuring nice updates in a great location with a nice large garage! Begin the next chapter of your life in this rambling ranch-style home with great curb appeal on a corner lot. Nice Large Space in the Corner of a Quiet Community!